For a traveler visiting Japan for the first time, saying goodbye to this land of awesome food and tradition was pretty difficult. Hence, to curb my Japan fever when I’m back home, I went pretty rampant at Narita Airport and hauled back quite a few Japanese snack. These Japanese snack were from Fa-So-La Tax Free Akihabara (duty free shop) at Narita Airport Terminal 2. 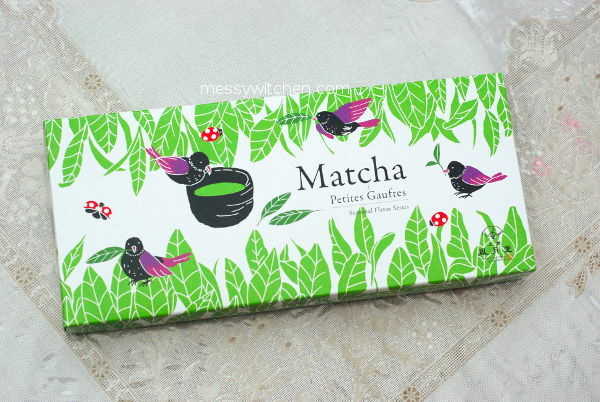 Ueno-Fugetsudo matcha petites gaufres. This is their seasonal flavor series. 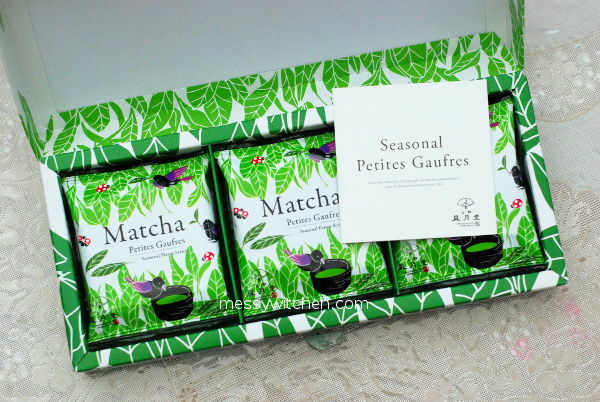 Ueno-Fugetsudo 上野風月堂 matcha petites gaufres @ 500 yen. It contains 6 packets. I bought it on December 2016. Expiry date printed on the box is May 2017, therefore it’s good for 5 months. 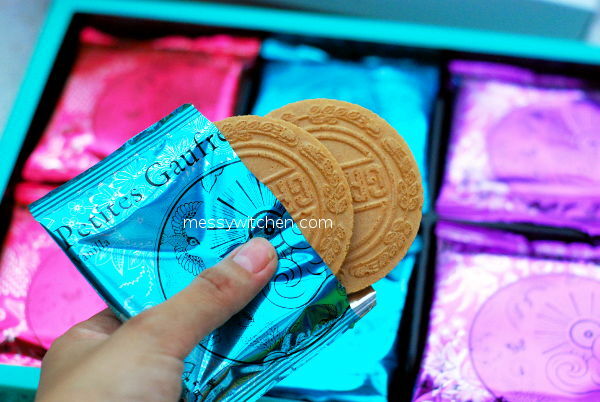 Each packet comes with two pieces of gaufre. In total, you have 12 pieces altogether. 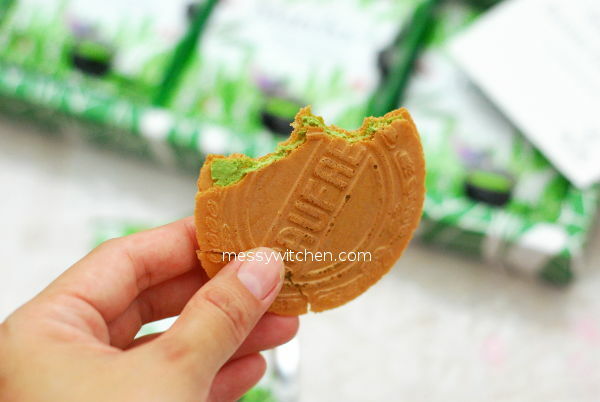 Sandwiched between the thin gaufre wafers is matcha cream filling. As you can see, the wafers are really thin. It’s crispy too. My verdict: I wasn’t wowed by it. The matcha flavor is mild. Ueno-Fugetsudo 上野風月堂 petites gaufres. Again, I bought it due to the packaging design. 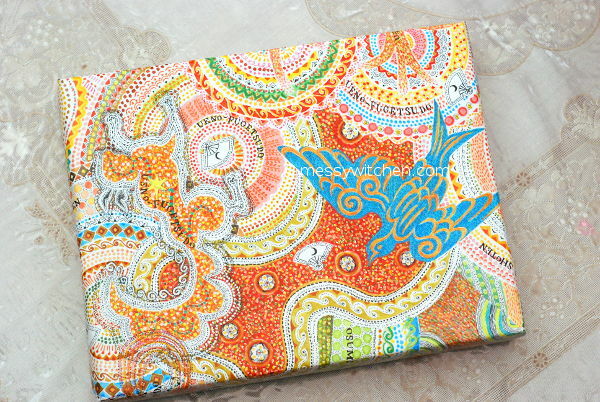 It’s pretty, right? 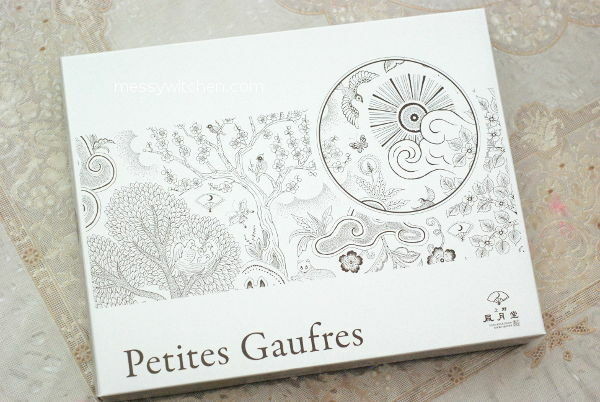 After removing the outer beautiful paper packaging, this is the box design for Ueno-Fugetsudo petites gaufres. Ueno-Fugetsudo petites gaufres – strawberry, vanilla, chocolate @ 1000 yen. It contains 12 packets; 4 packets each for the 3 flavors. The 3 flavors are strawberry in red, vanilla in turquoise and chocolate in purple. 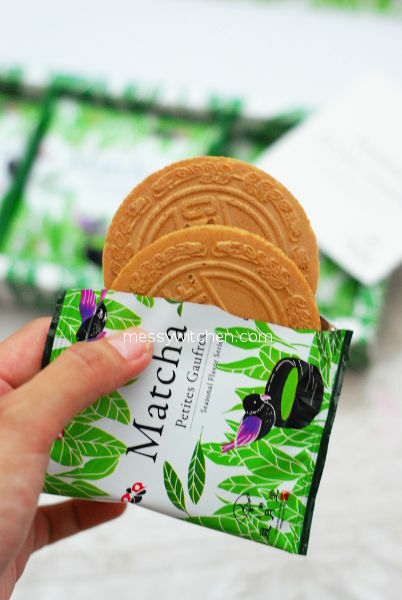 Like the matcha one above, its expiry date is May 2017. 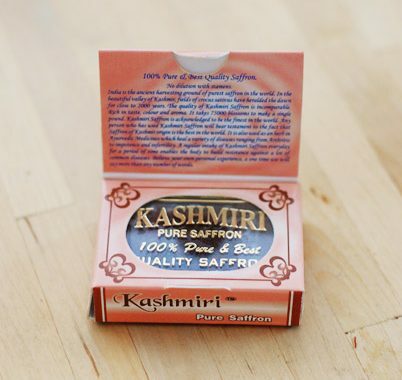 Each packet contains two pieces. 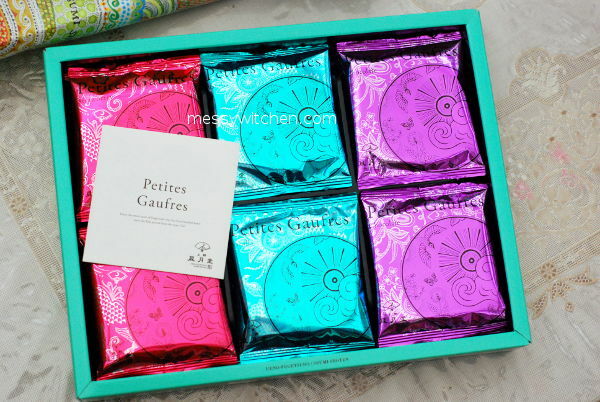 So, you get a total of 24 pieces petite gaufres. My verdict: Again, I wasn’t wowed by it. Perhaps, I don’t know how to enjoy this kind of snack. 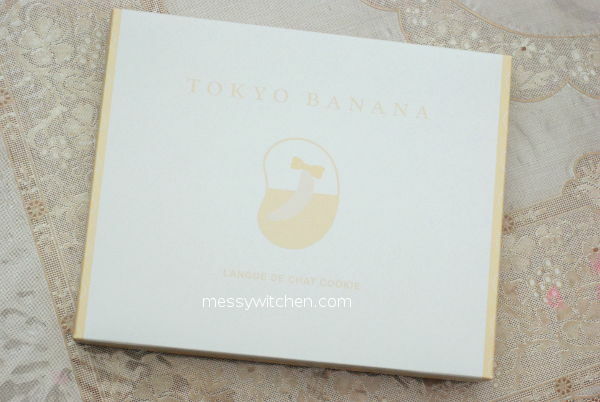 Tokyo Banana 東京ばな奈 original flavor @ 953 yen. This was bought by my sis. It has 8 pieces inside. As I’ve eaten this before (received as souvenir), I didn’t buy it again. The flavor didn’t tempt me. Tried once is enough. 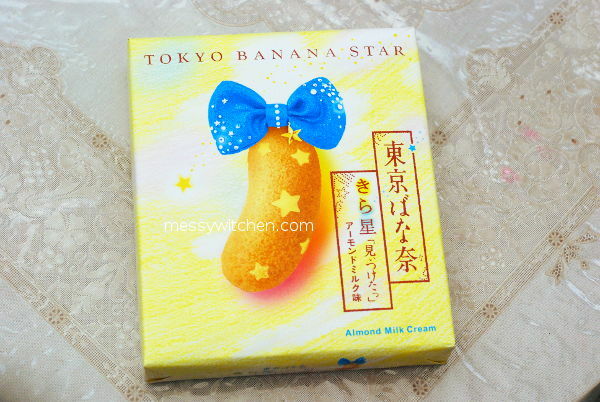 Tokyo Banana Star almond milk cream @ 1000 yen. This special is only available during the winter season. It contains 8 pieces. I’ve not tried this before, and find it quite fascinating. Both Tokyo Banana original flavor and Tokyo Banana Star almond milk cream have very short expiry date; 7 days! To prolong its freshness, what travelers usually do when they get back home is to freeze them. Don’t forget to share this good tip with your friends ya. 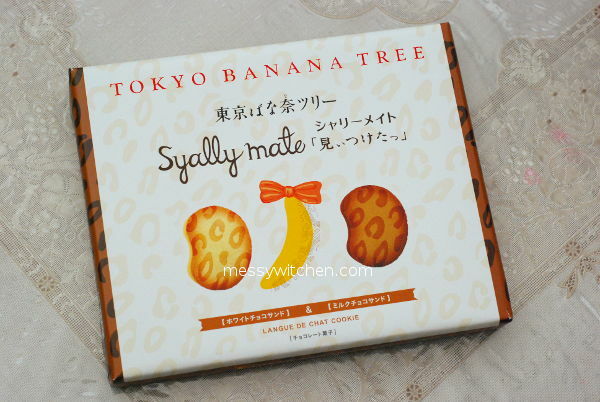 Tokyo Banana Tree Syally Mate langue de chat cookie. Langue de chat (French) means cat’s tongue because the cookie resembles a cat’s tongue. Of course it doesn’t look like cat’s tongue here because it’s shaped as banana, due to marketing purpose. 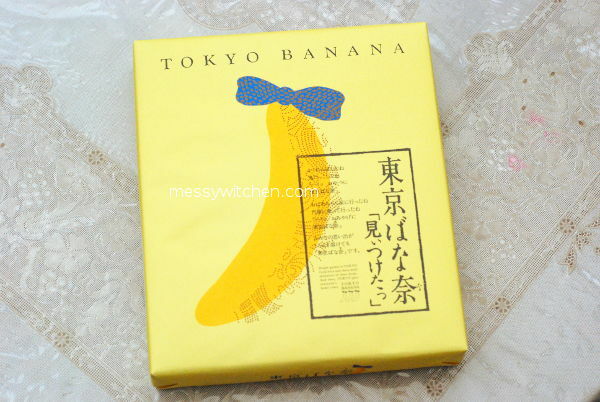 After removing the paper wrapper, this is the Tokyo Banana Tree Syally Mate box. The printings are rather light. 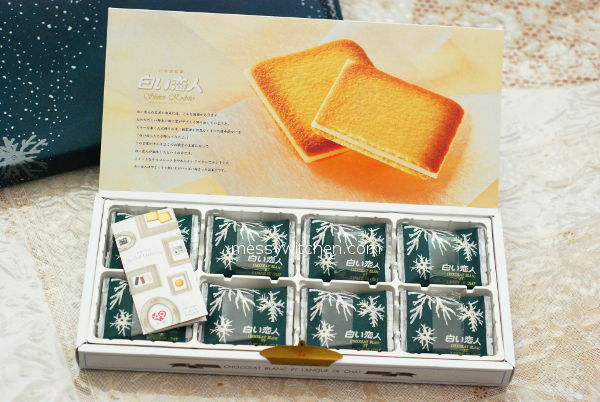 Tokyo Banana Tree Syally Mate langue de chat cookie @ 1000 yen. 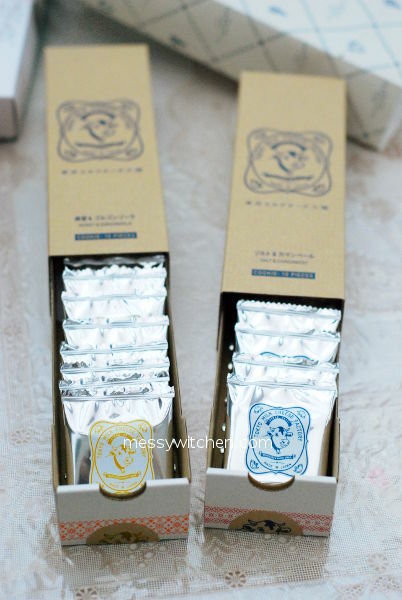 It contains 16 packets; 8 packets each for the 2 flavors. 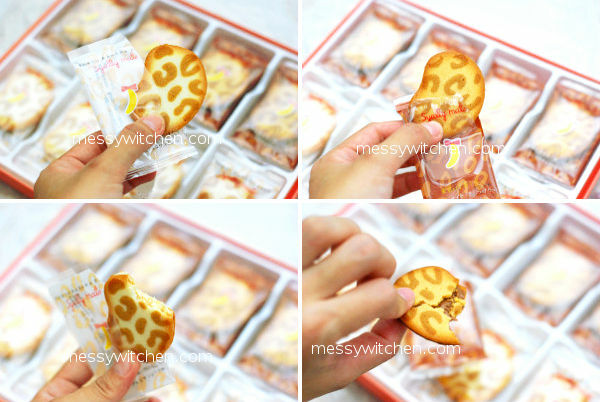 I love the packaging and cookie design (with leopard spots). So cute! Top row is milk chocolate filling and bottom row is white chocolate filling. 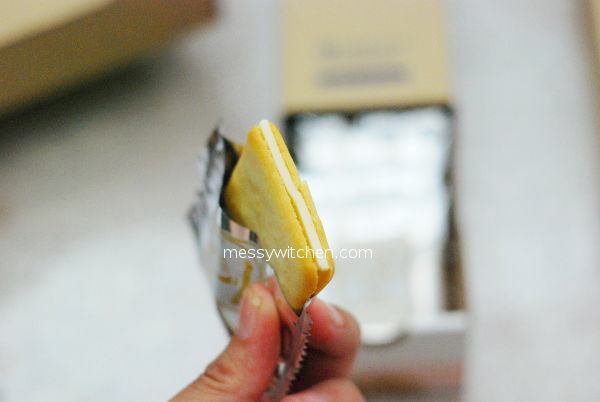 The fillings are sandwiched between langue de chat cookies. Bought on December 2016. Expiry date is February 2017, which means it has a two months window for this purchase. Both has nice banana smell, but as I eat more and more, the banana smell is overtook by the chocolate flavor. 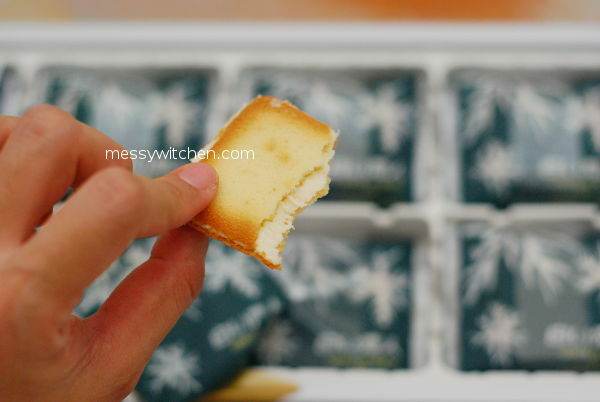 Shiroi Koibito 白い恋人 chocolat blanc et langue de chat. 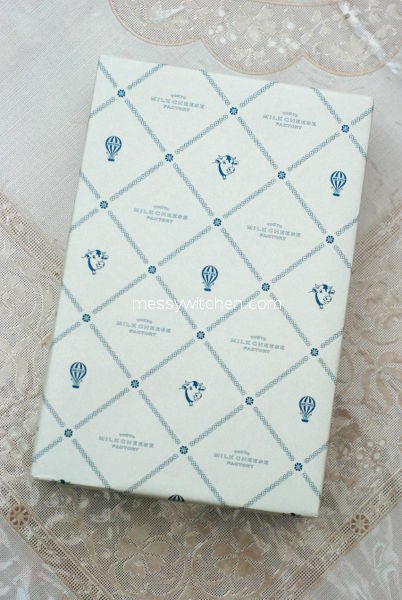 Love the blue-white paper packaging. 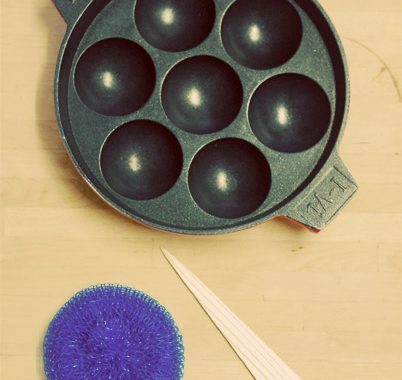 Simple design and yet magical. This is the snack that I’ve been looking forward to try. 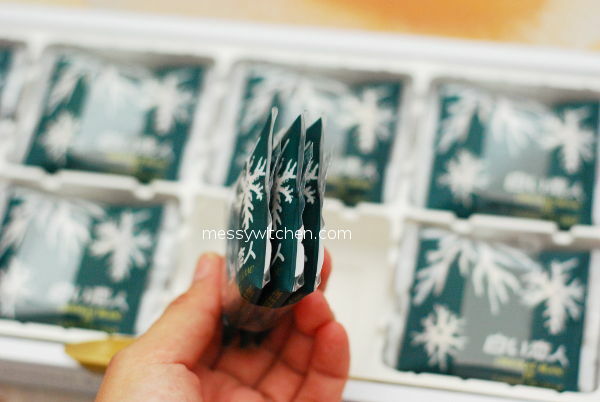 Shiroi Koibito chocolat blanc et langue de chat box. The mountain in box is Mt. Rishiri in Hokkaido. Shiroi Koibito chocolat blanc et langue de chat @ 1410 yen. It has 24 pieces. You can’t see 24 pieces here. Scroll below to find out why. Bought on December 2016. Expired on March 2017. It has 3 months freshness window. 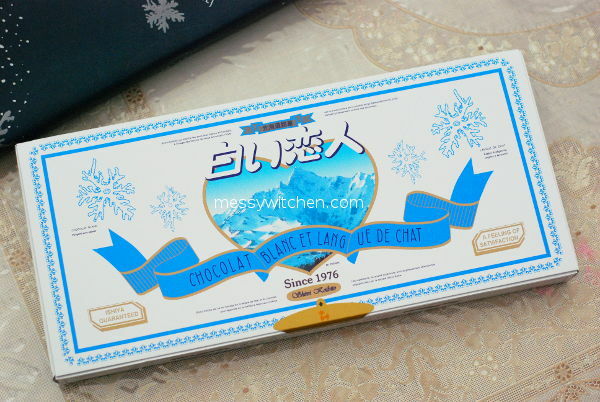 Chocolat blanc et langue de chat means white chocolate cat’s tongue biscuit. Each compartment has 3 packets of cookie. Since this box has 8 compartments, you get 24 pieces in total. 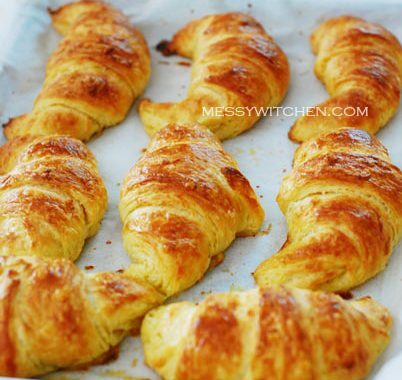 Every piece is perfectly baked. 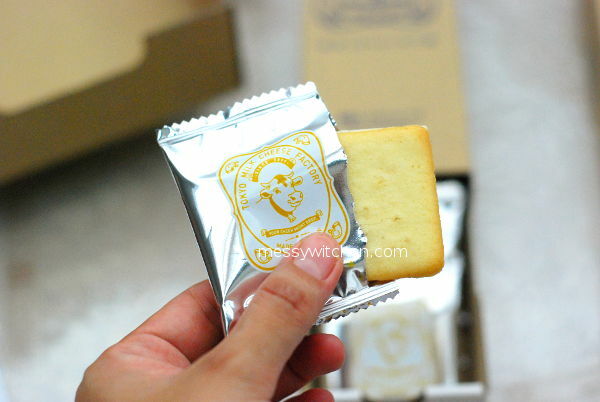 White chocolate is sandwiched between langue de chat cookies. It was quite sweet. Tokyo Milk Cheese Factory 東京ミルクチーズ工場. 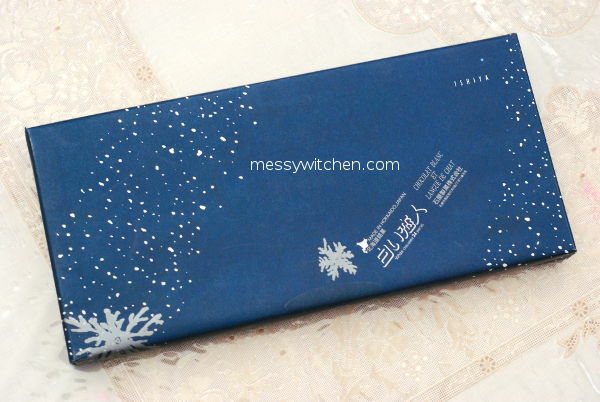 Now, I’ve never heard of this brand and I bought it on impulse because yeah, love the packaging! 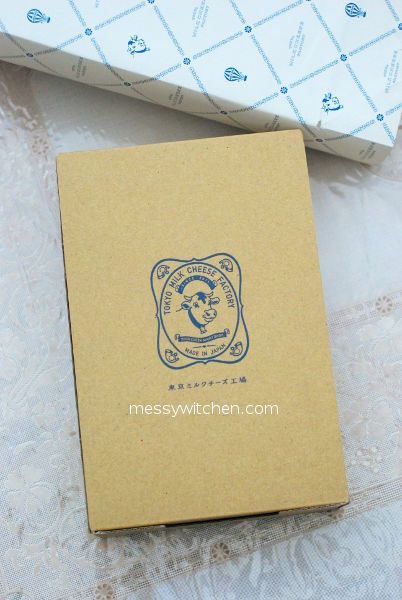 After removing the outer paper packaging, this is the box design for Tokyo Milk Cheese Factory. 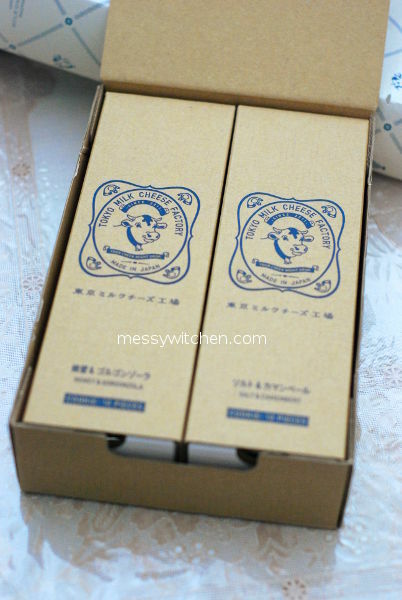 I love it that they use simple carton box. There are two boxes, which means two flavors. I really love how simple the design is and its functionality. Tokyo Milk Cheese Factory @ 1720 yen. The most expensive cookie from this haul. It has 20 packets in total, 10 packets each for the 2 flavors. The two flavors are honey & gorgonzola (left) and salt & camembert (right). I love the pull and push boxes, which act like a drawer! Bought on December 2016 and expired on March 2017. It’s good for 3 months. This is the honey & gorgonzola flavored cookie. 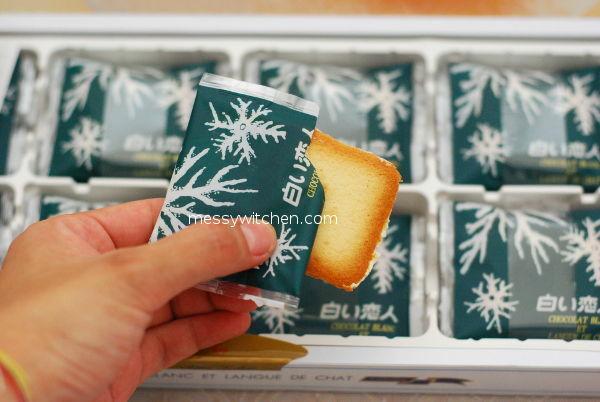 Just like Shiroi Koibito, it’s square in shape, but is not langue de chat. Just look how thick the gorgonzola cheese chocolate filling is. The same is for the camembert cheese chocolate filling. They are really generous with the fillings. My verdict: Love it! I love both, but if I have to choose, I will go for the honey & gorgonzola because I like the intense cheese flavor. 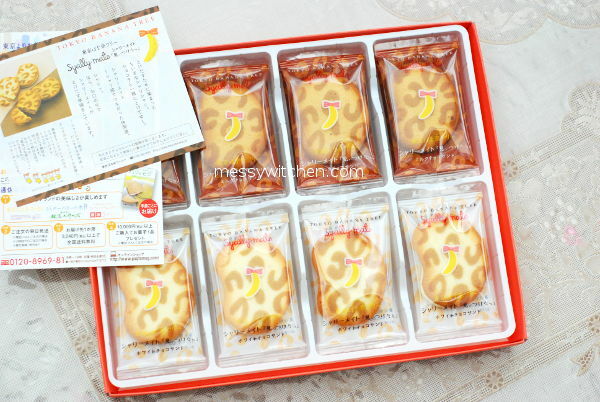 If you want to buy these snacks in Japan, I would advice you to get it from the airport because it’s slightly cheaper when I compared it to online prices (from their websites). Also, that way you don’t have to pack all these boxes in your luggage. You can carry them into the plane. That way, you have more luggage spaces for more stuff. Hehe.